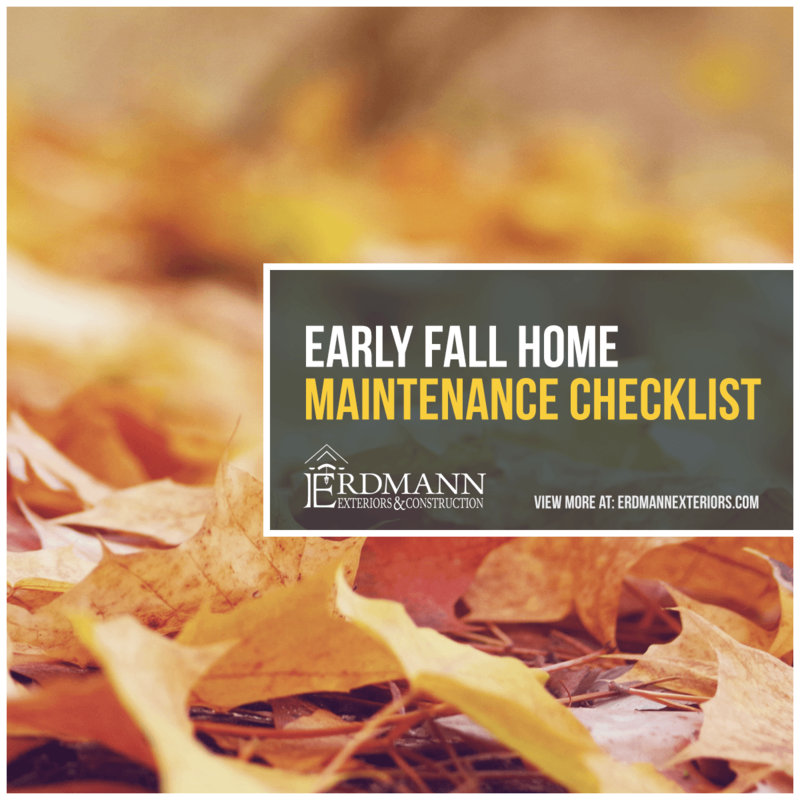 With the warm summer days behind us, make sure your home is prepared for the cold and icy seasons ahead by following our early fall home maintenance checklist! Download the checklist now, and view additional tips and details for each to-do item below. Before the cold and snowy season is upon us, it is extremely important to trim the trees throughout your property. Not only pruning keep your trees healthy but can help prevent property damage. Trees become susceptible to breakage during cold weather. Strong wind gusts, snow, and ice can cause branches to break and overgrown trees can pose a big risk to your home, car or garage. Fall is a great time for trimming. To ensure your grass returns in full force, it is best to aerate and seed your lawn in early fall. Aeration, the process of perforating the soil with small holes to better facilitate air and water flow to the roots, really pays off in spring. Throughout the summer, cycles of rainfall and drought are tough on your lawn. Combine the constant temperature and moisture changes with natural soil compaction and many fall lawns are in sad shape. If you have thin spots, or brown patches, aerate your lawn to get to the root of problem! While you can rent equipment and make this a DIY project, almost all landscape providers this service. Check your mail box for local specials. After aerating your lawn, overseed the bare patches. Your seedlings will germinate well in the cool fall temperatures and add the thickness and bright green color you are looking for in spring. A good fall clean up includes checking the little things – like the small screens in your faucet. Homeowners may experience reduced water pressure in their home, as water flow can sometimes be weakened by mineral deposits or other debris that gets stuck in the traps. To ensure you have enough water pressure you will need to clean out the traps (small screen) at the end of each faucet. To do this, simply unscrew the end of the faucet using a pair of plyers, remove the trap and flush out the debris. Simple and effective maintenance! Before it gets too chilly, take time to perform a thorough window cleaning. Removing the dirt and grime off your windows will allow more sunlight to enter your home during the often-gloomy winter. While cleaning, take the time to inspect each individual window as well. Make sure there are no gaps where air can escape, as properly sealed windows will keep your home energy efficient. With your hands, feel around each window. Do you feel a draft? If so, make minor caulking repairs as needed. If the gaps are large, or caulking doesn’t seem to work, consider having replacement windows installed before it gets too cold. On a sunny day, walk around the exterior of your home and inspect your siding thoroughly. Does your siding seem like it is warped, buckling or appear to have any other abnormalities? This may imply larger issues within your house. Are there any holes? If so this could be a potential insect infestation. Do you see any mold or mildew? This can indicate water damage. Siding is your home’s “protective armor”, so it makes financial sense to ensure it is well-maintained. If you think your siding needs to be replaced, investigate your options now, to ensure it can weather the winter. Before your roof is covered with snow, make the effort to safely take a look at the condition of your shingles. Missing or curling shingles are not a good sign. Heavy rains and snowfall can quickly become a water stain on your ceiling, if your roof issues aren’t addressed. Not able to inspect your own roof? Understandable. Call a professional, they can also take a look at your soffits. Tree debris collects throughout the summer but isn’t something most homeowners think about when the leaves are green. Your home’s gutters and downspouts work hard in fall and winter. Ensure they can do their job (moving water and debris away from your home) by cleaning them now. The first step, and easiest work, is to make sure your downspouts are connected to the gutters. Also, take the time to consider whether your downspouts are long enough to move the water far enough from your home. A clean gutter that efficiently moves water to a too-short downspout kicker that creates a pool next to your foundation is a problem waiting to happen. If you aren’t able to visually inspect your own gutters, it pays to hire-out the task. According to Home Advisor, the average price for a gutter and downspout cleaning ranges from $141 to $258, and takes approximately six hours. Preventative maintenance pays off. Act now, before the colors change, and the acorns fall. During the hot days of summer, your heating system was probably the last thing on your mind. Now that cooler temperatures are here, it’s time for a routine furnace check. Look around, many HVAC service providers have seasonal deals available. Schedule a check with your local HVAC repairman now. You don’t want to wait until the first snowfall to learn about a heating problem! Prevent the acceleration of surface erosions by filling in the cracks on your paved driveway before the harsh winter conditions set in. To do this, first make sure to remove any vegetation you see growing between the cracks. Next, depending on the type of surface you have, use cement, epoxy filler, asphalt filler, liquid cement filler, or concrete crack sealant to fill in the cracked areas. It’s an easy DIY! A good fall clean up involves a stiff bristled broom, and if you have one, a power washer. Concrete or paver patios as well as wooden decks benefit from a thorough cleaning before the first flakes fall. Removing built up debris such as tree sap, mold spores, and unnamed fungi is not only satisfying, but helps protect your investment. While you are cleaning with your tool of choice, inspect your decking for splitters, warped or cracked boards. If your deck is showing wear now, this winter’s snow and bitter temperatures are not going to help. It makes sense to act now and replace the worn wood and give it a fresh coat of sealant/stain. Individual pavers are not too difficult to replace, and that small hairline crack on your concrete patio is only going to widen during the future freeze-thaw cycles. Concrete caulks or sealants can create a surface patch and are worth investigating. You loved your outdoor space all summer, so fall is the time to show it some love ♥. Now that the prime BBQing season is over, early fall is the perfect time to do a deep cleaning of the inside and outside of your grill and is a lot easier to do this while it’s still bearable outside. Even if you still plan to use your grill throughout the fall and winter, it is still a smart idea to dedicate time getting your grill back into tip top shape. A thorough cleaning can improve your food’s taste, your grill’s appearance, and increase its lifespan. Remember, a clean grill is a safe grill – prevent flare ups! The humidity from the recent summer months can add a lot of mold, mildew and bacteria to your home’s air filter. During the early fall months, thoroughly wash the old filter and then leave it out to dry on a sunny day. If your household uses disposable filters, buy or order a new one now. 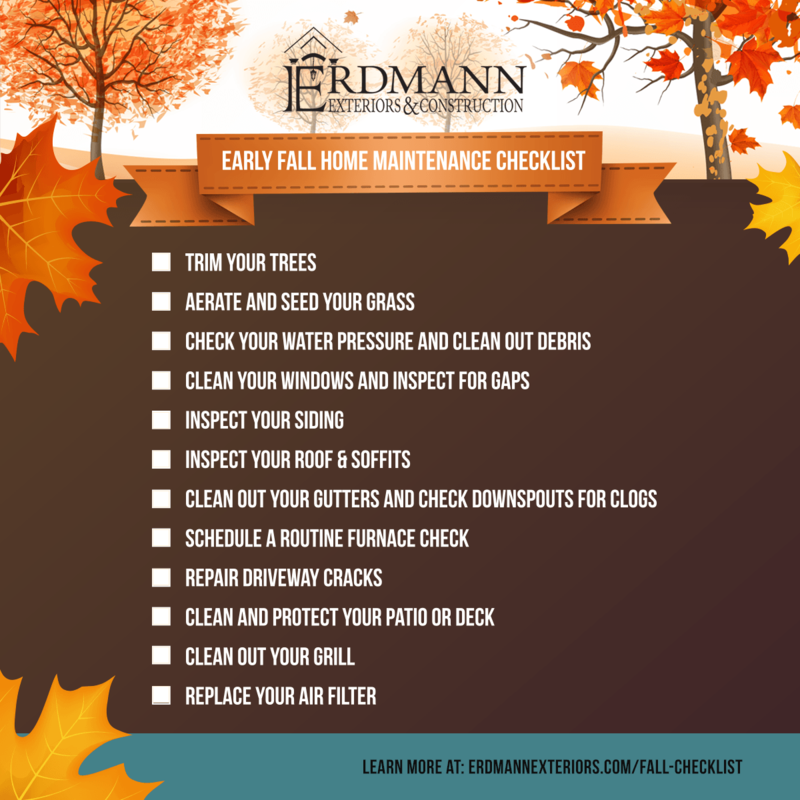 While inspecting your home this fall, if you’re worried your exterior may be worn or damaged and unable to sustain the upcoming winter, reach out to Erdmann Exteriors & Construction for a free consultation.